With the weather cooling in Philadelphia, I have been extra attentive to nourishing my dry skin. Neutrogena Intensive Moisture Wrap Body Treatment has been essential to my skin care routine for the past few weeks. The glycerin based formula is a useful ally in keeping my skin smooth and hydrated. An autumn scene in the Rancocas Nature Center. I have been using Intensive Moisture Wrap daily after showering. The light weight formula exists somewhere between a cream and a gel in texture. I found it moisturizes as effectively as a heavy body butter. I am really impressed with the fast absorption as well. This product is welcome on cold days. It's nourishing moisture penetrates the skin quickly. Especially in winter, I value a moisturizer that sets almost instantly. This skin treatment is great to have on hand for the holidays. The formula is sheer enough to be worn under holiday dresses. You could easily treat dry skin without concern for delicate fabrics being damaged by the residue of moisturizing butters or oils. Intensive Moisture Wrap is available in scented and fragrance free varieties. I am reviewing the scented formula. The photo of the box with the fragrance free label was provided by the PR company. I find the scent to be clean and fresh with a soft powder note. The fragrance is pleasant, but it doesn't interfere with any perfume I choose to wear. The ingredients include: Water, Glycerin, Capric/Caprylic Stearic Trigylceride, Dimethicone, Cetearyl Alchol, Petrolatum, Octyldodecanol, Stearic Acid, Glyceryl Laurate, Stearyl Alcohol, Hydrogenated Lanolin, Triethanolamine, Silicone Polyether Copolymer, Imidazolidinyl Urea, Methylparaben, Propylparaben, Steapyrium Chloride, Sodium Cetearyl Sulfate, Sodium Sulfate, BHT, Fragrance. The glycerin based formula reminds me of other shielding body lotions I have tried. It does an exceptional job of healing dry skin. I have had no problems with dry patches or irritation since using Intensive Moisture Wrap. When I run my hand over my skin, I can feel a protective softness. I have been using Intensive Moisture Wrap as a hand treatment while housecleaning. Although I wear gloves for dishwashing and heavy scrubbing, I find this lotion to quickly replenish moisture after doing basic chores like laundry or dusting. I love the convenience of the pump dispenser for a quick application. There is an added benefit of affordable pricing and availability compared to similar treatment lotions. The retail price is $9.99 for 10.5 fluid ounces (310 mL). If you are looking for a lightweight formula lotion to help guard your skin against winter dryness, I can definitely recommend Intensive Moisture Wrap. 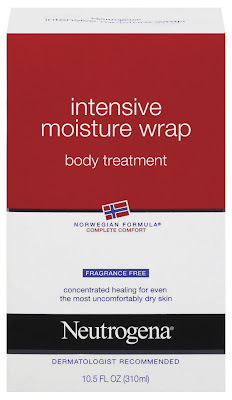 Intensive Moisture Wrap Body Treatment was sent to me for review. This product can be purchased at neutrogena.com or check your local drug store. Thanks for sharing the review. I've been looking for a lotion to keep at my work desk since my hands get dry so quickly in the winter; I'll have to pick up a bottle o' this stuff. I've never tried this one before. I have used the Norwegian formula which I love. When the weather starts getting even colder my fingers crack on the tips of my nails. They really hurt! Norwegian formula is what I always went to. I've seen this before but never tried it. Might do that sometime. Thanks very much for a good review ..i was looking for Moisture which will take care of my skin in winter. so its very useful post for me. Thanks again for this post.